We have seen loads of awful to great attempts at making a car advertisement that’s funny yet provides all the information you must have about a car. From official attempts to amateurs making video reviews for their favorite cars, they all try their level best at giving the funny look to their commercial however, the best out of every Corolla advertisement whether on TV or the internet I have seen – this one made by Clark Olson media stands out as the best amongst all time greatest for being funny and actually presenting a short but precise review of the car as well. This is a 10,000 US$ prize-winning video of a competition held last year, “Kelley Blue Book “Video Car Review Contest” which was made by two high-school friends, David Olson and Guy Clark who call themselves “Clark Olson Media”. 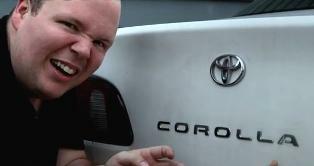 The video features Neil Arsenty saying Corolla in the best way possible.